Merano has been famous for its avant-garde approach to wellness ever since the 1800s, when the much-travelled Princess Sissi elected the city in Italy's Trentino region as the ideal location for her spa escapes. It was opposite the Princess' favorite footpath, on the South bank of the river Passirio, that Merano Terme was built in 2005. Star architect Matteo Thun was responsible for creating this spectacular spa: a massive metal and glass cube, filled with light and affording incredible views of the surrounding mountains. At the center of the spa, there is a whopping great 240sqm indoor-and-outdoor swimming pool, from where you can dip into smaller salt-water pools' or radon-rich thermal baths. In the summer months, facilities available in the Water World include Kneipp baths, a counter-current swimming pool, sports pool, a paddling pool for non-swimmers, and a relaxing spring bath. Add the center's 50.000sqm spa park and you can see why this is such a popular place for a summer spa break! Water is not the only natural element employed at Terme Merano. Steam is used to create lasting sensations of wellbeing too, in the spa's classic saunas, steam baths, Finnish saunas and caldarium. Can't take the heat? You'll love Terme Merano's exclusive Snow room, in which flakes of snow fall softly from the ceiling, gradually cooling the body temperature (don't worry, there's no risk of suffering thermal shock!). 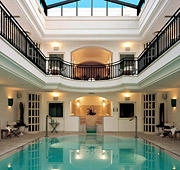 Terme Merano uses two types of thermal water. The first, rich in radon, is used in the baths and in a series of natural spa treatments; the second has a high concentration of mineral salts and Oligo-elements and surfaces at a temperature of 33°C. From November to March, you can enjoy the benefits of steam and water long after the sun has set, floating in the warm thermal waters, surrounded by delicate games of light, listening to the sounds of soft background music... until midnight!